Consider the lowly staple remover, an office tool both ubiquitous and unrespected. You wouldn’t think that so long as there was one successful variant of this tool that anybody would give it much more thought. But that would be far from the truth. Today’s vintage item is the APSCO Zip model 625 staple remover. This is one of the most distinctive staple remover designs ever made, and in my opinion one of the coolest. Not the most practical mind you, but definitely cool. The model 625 measures 5.25″ L x 2.25″ H x .313″ W, weighs one ounce, and is made mostly of plastic. It is a trigger-action staple remover which by its design makes it more mechanically complicated than most. Of course, most removers are made up of about three pieces (and many are just a single piece of steel), but still. It is stamped Zip Products Company Los Altos, Calif. USA on the reverse side. Furthermore, both the utility and design patents show this as being assigned to Zip Products Co. You would therefore assume that this was produced by Zip Products Co. However, I recently came upon an APSCO sales brochure from 1953 that shows this as an APSCO product. While I don’t have further information, it appears likely that this was made by Zip Products Co for and marketed by APSCO. There were two patents granted for this staple remover, utility patent 2762604 which was filed January 9, 1953 and granted on September 11, 1956. There was also a design patent, 169859, filed on January 9, 1953 and granted on June 16, 1953. The inventor and designer was W.H. Misson of Los Altos, CA and he assigned both patents to Zip Products Co. The model 625 has “PAT. PEND.” stamped on it. This means it was likely manufactured sometime between January 1953 and September 1956. This is what I call the “safe time zone”. When an item is stamped patent pending then it most likely was manufactured after the patent was filed but before the patent was granted. Keep in mind though, that depending on circumstance it could have been made before that time (if the patent was filed prior to that date but rejected for instance) or up to several years after the patent was granted if the manufacturer didn’t update the machine stamp for whatever reason. However, in this case I know that this was available in late 1953 and I believe it’s safe to state that this was made between 1953 and 1956. Not so surprisingly, this doesn’t seem to have been very popular or to have been made for very long. In all my years of collecting I’ve only seen one of these so in all likelihood it can be considered rare. The model 625 certainly works, but only with staples no larger than modern standard size. It would not work with older staples (such as Hotchkiss or Crofoot) nor with heavy-duty staples. Also, it does have a tendency to tear the paper more than other types of removers. And finally, while this will work well-enough on stapled papers lying flat on a desk or table, if you need to hold it any other way such as up-in-the-air for whatever reason, it will be awkward and make a mess of things. While I think that Mr. Misson missed with this design, I still applaud him for his efforts and originality. He may not have been successful with the model 625 but it wasn’t for lack of trying. 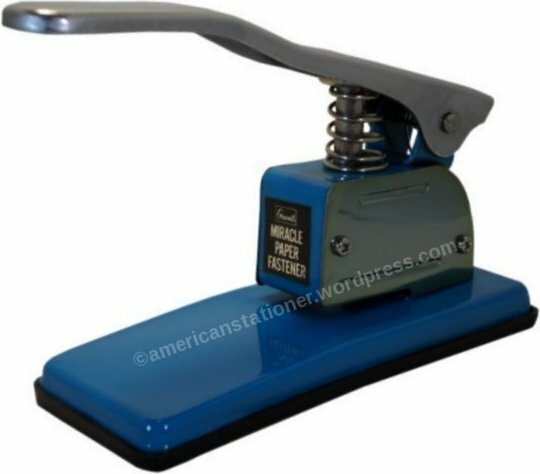 The Miracle Paper Fastener was another in a long line of stapleless staplers that can trace its origins to the Bump Fastening Method. The Clipless Stand Machine and Bump Fastener spawned what seems like a countless number of clones over the decades, which is what the Miracle Paper Fastener is. Sold in the early to mid 1970’s until about 1975 this fastener was made in Japan for sale by Grants and under their name. Grants at one time was the third largest merchandiser in the United States after Woolworths and Kresges. While Kresges lives on today, now better known as “K-Mart”, Woolworths has long since gone out of business and Grants declared bankruptcy in February 1976 and was out of business by the end of that same year. The fastener weighs 12 ounces and measures 5.75″ L x 2.125″ W x 4″ H. They don’t appear to have been on sale for very long. So despite the fact that they were inexpensive and easily available at the time not many of the ones actually sold have survived over the years. I wouldn’t consider them rare but it wouldn’t be an exaggeration to say they are uncommon. This fastener is well-designed using the then 60 plus year old (and over 100 years old now) and proven Bump fastening method. The large handle gave you good leverage when fastening papers. The only let down is the cheapness of the materials used. Of course, this would have been sold as a home-use item so you wouldn’t expect it to get lots of regular use. Variations of this item are made even today. 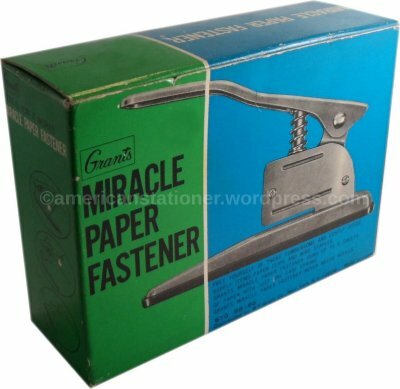 The design used for the Miracle Paper Fastener was marketed under a number of different names and by different companies but those would have been the only discernible differences amongst them. The fact that this technology has been used continuously since it’s inception is a testament to George Bump and his amazing idea that is still going strong over a 100 years later.